What is 3D printing? 3D printing takes a 3D computer model and turns it into a real object. It does this by adding material together, usually a layer at a time, thus allowing almost any shape to be created with relative ease. Most home 3D printers use Fused Deposition Modelling (FDM). This uses a filament of plastic material, a bit like a string. The filament is fed from a roll into a heated head, which melts the plastic. To start producing a part, the head extrudes melted plastic onto the bed of the machine. The head moves over the bed, in 2D, depositing the first layer of material. Once the first layer is complete, the head is moved up, by the thickness of the first layer, and starts depositing the next layer on top of it. The part is built up layer-by-layer. FDM printer showing: Plastic filament (a); heated head (b) which moves in x and y to produce a layer; model being built (c); support structures also being built (d); bed which moves in z between each layer (e); and open volume of the machine (f). Popular FDM 3D printers include MakerBot and Ultimaker. You can even build your own printer by following the instructions on the open source project RepRap. Download a 3D model you want to print, or design one yourself. You can find one to download on Thingiverse or GrabCAD. To design a model, you could use Google SketchUp or Blender. For engineering parts, Computer Aided Design (CAD) software, such as SolidWorks, is better. If it isn’t already, convert your model into a 3D printing format, such as an .STL file or .OBJ. Import your model into slicing software, such as MakerWare, Cura or Simplify 3D. MakerWare works with MakerBot 3D Printers. Cura and Simplify 3D produce G-code which works with most 3D printers. Configure the build in your slicing software. First, you should decide how to orientate your model on the 3D Printer. For FDM, you want to minimize overhangs steeper than 45 degrees, since these will require support structures. When deciding on the orientation you might also want to consider how the model will be loaded so layers won't be easily separated, this is a bit like using the grain in wood. You might also control how support structures are added to the model. To save time and materials, models are generally not solid. You specify the infill percentage (typically 10-35 percent), the number of perimeter layers (typically 1-2), and the number of bottom and top layers (typically 2-4). There are lots of other things to consider when preparing your model for 3D printing. Export the program, typically a G-code file. Your slicing software will convert your model, and the build configuration you specified, into a set of instructions. Your 3D printer will follow this to build the part. Transfer the program to your 3D printer using an SD card, USB, or Wi-Fi. Print the model on your 3D printer. When the 3D printer has finished building your model, you'll need to remove it and possibly also clean it. You should break off any support structures and rub off any remaining lumps with a fine sand paper. 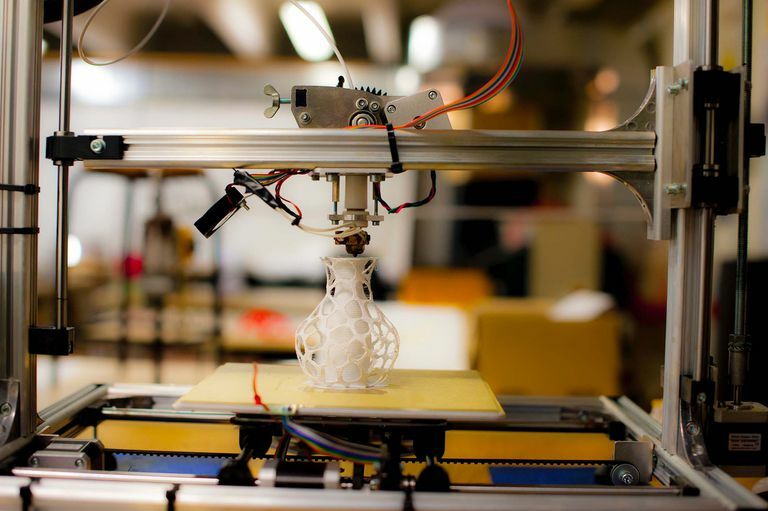 In the past, 3D printing was called rapid prototyping, since that's what it was used for. In modern industry, 3D printers are now able to produce high-quality parts and the term additive manufacturing is normally used. 3D printing is commonly used to refer to both industrial additive manufacturing and 3D printers designed for home model making. Industrial additive manufacturing usually uses some form of 3D laser printer. These often have tanks full of powdered or liquid material. A laser then traces out a profile on the top surface of the material, forming it into a solid layer. Ultraviolet lasers are used to cure liquid resin into solid plastic. High-powered lasers are used to heat powdered plastic, metal, or ceramic, until it fuses together. You’ve probably read somewhere your home 3D printer will soon make everything you need. You’ll simply download a file and it will print your clothes, spare parts for your car, and perhaps even your dinner. Take these claims with a pinch of salt. One impressive announcement claimed 3D printers in China built 10 houses in a day, at a cost of just $5,000 per house. In reality, each 3D printed house was just a single room and they only really made the walls and the roof, which make up less than 10 percent of the cost of a house. Land aside, most of the build cost isn’t for the basic structure. Other things like plumbing, electrics, insulation, and carpentry add up to cost a lot more. So don’t expect to buy your next house for $5,000. In most cases, 3D printed parts are either much lower quality or much more expensive than parts produced using more traditional methods. In many cases, they're both. 3D printing isn’t anywhere close to replacing traditional manufacturing. So what is 3D Printing Good For? 3D printing has been used for decades for quick low-strength prototypes. This type of 3D printing is now affordable and perfect for home model makers. It can also be useful for replacing things around the house that are hard to find, such as matching knobs and handles on cookers or furniture. If the part doesn’t need to be particularly strong, 3D printing can be a good option. In industry, 3D printers are used to produce complex aerospace components, optimized for strength and weight. If a lot of very detailed machining or casting would be required, 3D printing can be economical. There are also lots of emerging applications in medicine for 3D printing producing tissue scaffolds for body parts.